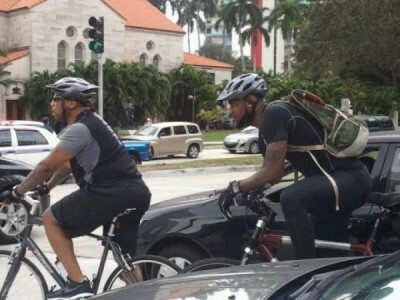 I think most cyclists were confused by the media reaction to Lebron James commuting to work on a bike. As Lebron said himself, what was the big deal? It wasn’t any deal and especially to those of us who ride in a city with pro ball. Local builders in Seattle, like Davidson and Erickson, have built custom bikes for big and tall customers. @Dschrempf used to raced with us. I mentioned that on Facebook and friends responded with their Detlef stories. While the media continues to marvel at Lebron James commuting to work on a bike and wondering if/how that affects his game, I remembered how many times I’ve been in a bike race with @Dschrempf. A few and this one time, we locked bars at Ballard going into turn one. Detlef’s bars were enormously wide, like scaffolding that held him upright. As we turned, I rode under and up into them. When I steadied myself against Detlef, my helmet was in his ribs. Drafted behind him for almost 75 miles in Bellingham. What a motor. Brian shared photos from his days with Det on the Byrne Invent team.